Built exclusively for Sherman, Gilliam, and Wheeler counties. January 2018 Wheeler AP (Access Point) Sites; Fossil, Mitchell and Spray are now served from the Frontier Headend at Erskine (Erskine is on fiber optics) and over the significantly upgraded Frontier backhaul radios to each of the AP sites. Coming soon (the equipment is already in place) all of the AP microwave radios at each of the aforementioned AP sites will be upgraded to the latest technology from Ubiquiti. 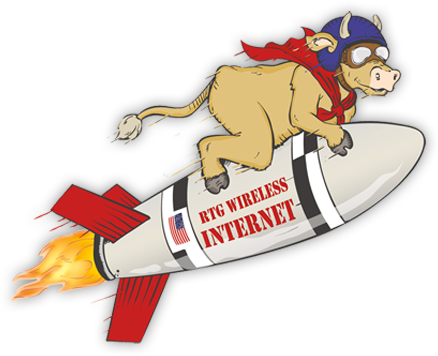 Rural Technology Group (RTG) was founded in 2009 with the objective of bringing affordable true high-speed Internet to the towns and rural homes of Sherman, Gilliam and Wheeler Counties. Using the data backbone that your county and the North Central Education School District (NCESD) originally built to support education and public safety, we deliver a fiber Internet connection via a small wireless relay. The RTG high-speed network employs the most advanced fixed wireless technology in the region. It's super fast, always on, safe, secure, and a great value. Call us today at 877-656-3532 and get the very best for less!